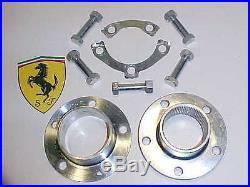 THESE ITEMS UP FOR SALE ARE A. Ferrari 365 GTB/4 GTS/4 Daytona Splined Wheel Hub. Scroll Down to see photos. Brand New Old Stock, they were removed years ago from brand new wheels but never bolted up to a car. In perfect condition, ready for installation. Sale is for one Wheel Hub. Also includes Five Mounting Bolts _Five Nuts _Two Nut Retainer Lock Plates. Very rare Hub to find in original.. The item "Ferrari 365 Splined Wheel Hub Bolts Nuts Retainer Lock Plates GTB4 Daytona OEM" is in sale since Tuesday, November 28, 2017. This item is in the category "eBay Motors\Parts & Accessories\Vintage Car & Truck Parts\Wheels, Tires & Hub Caps\Wheels". The seller is "tony_randazzo_308_ferrari_maserati" and is located in Stroudsburg, Pennsylvania. This item can be shipped worldwide.